...and soon to be demolished. 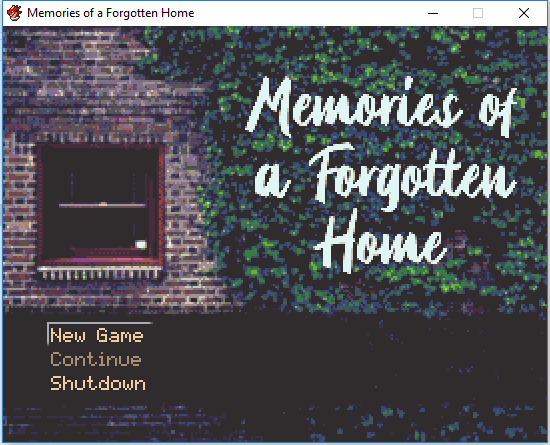 Memories of a forgotten home was made for the global game jam (https://globalgamejam.org/2019/games/memories-forgotten-home). 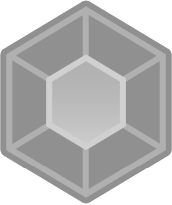 The premise of the game is that Scott returns to his childhood home later in adult life and finds that he can barely remember anything about his time living there. The game is about him exploring his old home and slowly recovering some of his memories. In terms of presentation the game is stellar, every room has been meticulously created and thet look great. The portraits are really cute and used to great effect. I don't know whether it was deliberate or a case of ran out of time but Scott's parents' portraits are shaded in a very different dark style, which given Scott's relationship with them is a very clear visual representation. Either way for me I found it to be a nice touch. The game's music fits well themantically and helped to set the mood through out. See that person behind the portrait? So moving onto what the game does less well, while I found the whole game to be bug free I did notice a few issues. One conversation had the person I was talking to vanish at the start of the conversation (when presumably he should have dissapeared at the end). Next in the screenshot above you can see the portrait covers up one of the npcs, regretably this caused me some confusion early on in the scene as it was the hidden sprite that was talking. Also the save point is a cow... why? 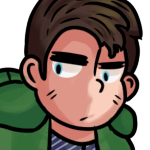 Anyway besides these minor issues it's time to discuss the core gameplay which is largely a treasure hunt as you wander around from room to room looking for your next marker. Some of the marker locations are communicated well, either a direct go to or a clue. However sometimes there was nothing to direct you and you have to resort to re-checking every room though from the experience of having played the game, no room was re-used so if you've found something in a room already, feel free to ignore it when looking for your next room. 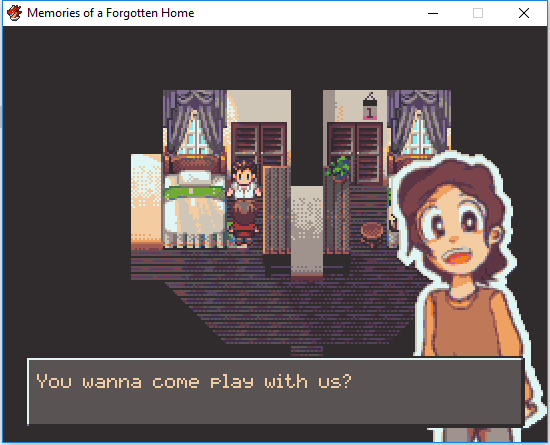 Memories of a Forgotten Home is about 10 to 15 minutes long and overall I did have fun and enjoy it so I can heartily recommend a play through. I hope you have fun!